We dealing with 100% genuine Thailand Somdej Amulet and introducing effective Amulet for your needs at great value. Please call us at +6012-6232250. Somdej Pelw Phelng Phim Tor Luang Phor Pilan Wat Rakang BE2407. This Somdej mixed with Phong Bailan and 5 kinds of holy powders of Somdej Toh, which are Phong Pattamang, Phong I-thijay, Phong Maharaj, Phong Buddhakhun & Phong Tri Nisinghe. Luang Phor Pilan was the disciple of Somdej Toh. This Somdej also called Phra Sorng Somdej which means two Somdej made it together. It won No4 Placing in Thailand ChaengWattana Grand Amulet Competition on 19th June 2016. It won No1 Placing in Thailand Chiangmai Grand Amulet Competition on 21st August 2016. Attached with Gold Open casing. 阿赞多在2375 年开始成为屈拉康住持 ,而现在市面上所认可的阿赞多崇迪亦为2401-2411年,这些天价崇迪特别是在屈拉康所做的传说亦是必兰所做; 这种说法亦不无道理, 因为当时阿赞多的年纪亦开始老迈! Somdej 5 Chan Luang Phor Phu Wat Inn. Somdej Luang Phor Phu is one of the top 5 Somdej in Thailand. Luang Phor Phu was the top student of the great Somdej Toh Wat Rakang. His amulets contained mixture of all 5 types of sacred powder (Phong Putthakhun, Itichy, Tri-singhe, Maharaj, Putthamang) obtained from Somdej Toh. It won No1 Placing in Thailand Hua Hin Grand Amulet Competition on 2nd April 2017. Attached with Gold Waterproof casing. First Batch Somdej Lang Liap Luang Phor Sin Wat Lahanyai BE2536. Phim Kamakan made 1000 pieces only. Powder mixed with Phong Prai Kuman. Somdej Phim Prok Pho Khanaen lang yant luk Luang Phor Toh Wat Praduchimplee BE2521. Nur bailan, made 300 pieces only. It won No1 Placing in Thailand Amulet Competition on 19th November 2017. Somdej Saoha Luang Phor Pherm Wat Pom Kaew BE2550. Nur Ngern, Serial Number 482. It comes with original temple box. Somdej Kee Seur Lek Luang Phor Unn Wat Tankong BE2530. Nur Rare. It won No1 Placing in Thailand ChaengWattana Grand Amulet Competition on 2nd October 2016. Somdej Prok Pho Lang KhawSarnDam, Luang Phor Toh Wat Praduchimplee BE2516. Made 7500 pieces only. The black glutinous rice were found from the same Chedi as Phra Leela Kampaeng Petch and it is estimated that these rice were really ancient and exceeded 1,000 years. The purpose of making this batch of amulet is to raise funds for the repair and restoration of Wat Praduchimplee. First batch Somdej Luang Phor Mee Wat Manwichai BE2507. Phim Niyom. Co-blessed together with his master Luang Phor Chong Wat Natangnok for 7 days and 7 nights. Material mixed with 108 types of herb, 108 types of phong kesorn, 5 great powders (Phong Putthakhun, Itichy, Tri-singhe, Maharaj, Putthamang). Very good for metta purpose. Somdej Sam Chan Nur PhongLuang Phor Waen Wat DoiMaePang BE2516. First batch Somdej Luang Phor Mee Wat Manwichai BE2507. Phim Niyom. Co-blessed together with his master Luang Phor Chong Wat Natangnok for 7 days and 7 nights. Very good for metta purpose. Somdej Sum Reung Kaew Chao Khun Nor Wat Wiwek Wanaram BE2513. Phim Niyom, made 500 pieces only. This somdej is made for donation to build pavilion for Wat Wiwek Wanaram and the material contained the old somdej powder from Wat Rakang, Kru Wat Bangkhunpom & Wat Sam Plum, Chanmak Luang Phor Klai Wat Suankan, bodhi tree leaf from Wat ThepSirin, material from Chao Khun Nor, 108 Wahn & others. This batch of amulet blessed for 5 times between BE2511-13. 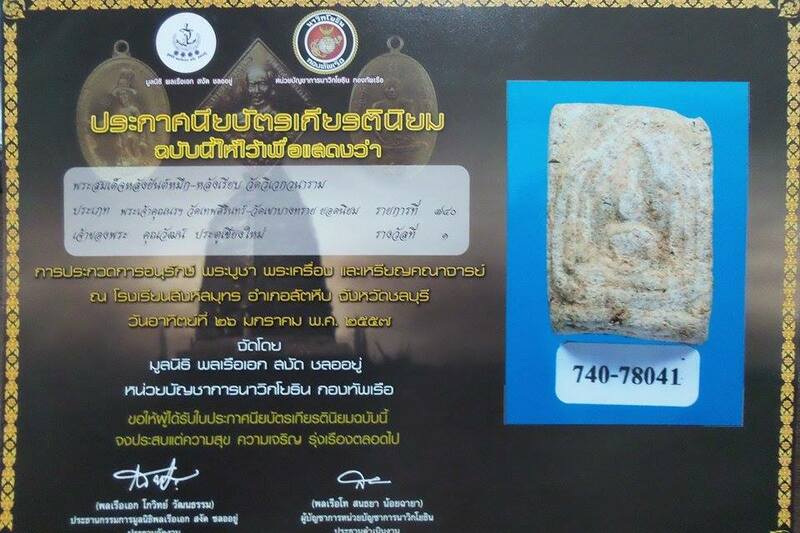 It won No1 Placing in Chonburi Grand Amulet Competition on 26th January 2014. Attached with Open Silver Longya casing. Somdej 5 Chan Phim Yai Luang Phor Unn Wat Tankong BE2543. Nur Sangkaya. Made 3,500 pieces only.